Enjoy quiet and effective drying of loads with the WTV76100CN, a 3.9 cubic ft. dryer from Bosch that comes in a stylish white finish. See some of its key features to know if this dryer is the best for your laundry needs. - The unit comes with 9 handy drying cycles to fit virtually all kinds of materials in the load. - The 3.9 cubic ft. drum makes this unit perfect for small families. - Use the LED display to look at the status of the cycle and other electronic controls. - The high quality stainless steel drum is durable, less prone to rusting and chipping, less prone to snagging fabrics. - The machine uses high volume air flow and moderate heat for gently the drying of fabrics. - The gentle drying option does not break the fabrics down, which means that there is less lint deposited on the lint filter. - The WrinkleBlock feature tumbles the load for up to one hour to remove wrinkles and reduce ironing time and energy consumption. - Reduce the drying time for lighter loads with the Touch Up cycle. 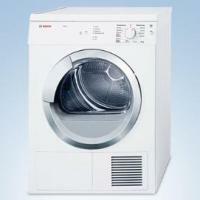 - The unit comes with the Delicates option that is designed to dry fabrics that you only used to line dry. - The automatic moisture monitoring system detects the amount of moisture left in the tub and adjusts the length of the drying cycle accordingly, saving on power consumption. - The electric power source makes looking for power more convenient compared to when using gas dryers. - The stackable design allows you to stack the dryer on top of the washer to save on room space. The front-loading design makes stacking possible. - The machine also comes with the Timed Dry feature, which allows you to set the duration of the drying cycle. One of the main perks with this machine is the quiet operation. It easily hums in the background, although there is a slight increase in noise and vibration at the very end of the cycle. Lining the bottom of the unit with felt padding with solve this problem if the noise gets too loud. Another advantage is the stacking option, which makes this perfect for small laundry rooms. Finally, the unit comes with basic, no frills controls, which make operating the settings and programs very easy to do. Missing features are some of the reasons why this unit is not chosen by some customers. Missing features include Air fluff/ no heat, jeans option, active wear, and audible signal. The absence of the interior light makes looking for missing pairs of clothing harder to do. There is also no cooling option, which means that you cannot dry and run. You have to wait a few minutes before you can start unloading. Finally, there is no child lock, which means you have to monitor the kids when they go near the dryer while it is on. The dryer squeaks as it turns. It happen on and off. I purchased an extended warranty and when the repair person opened the unit, he said that there wasn't any damage to the bearings, it was just lint that collects there and causes the squeaking. So he cleaned it out, and left. It still squeaked shortly after. I clean the filter EVERY time after usage. It is a high pitched annoying sound. Sometimes if I kind of shake the dryer it stops, or basically if I take everything out but one or 2 pieces it stops. Another very annoying feature is if I dry a set of sheets, invariably the dryer creates one huge ball out of the fitted sheet with everything else tucked inside, so it can go around forever, but all the items inside will remain damp. I do not recommend this dryer.